During the opening shows at BlizzCon today, Blizzard announced a brand new competitive first person shooter (FPS) currently in development going by the name of Overwatch. Overwatch uses cartoonish styled art comparable to games such as Team Fortress and Monday Night Combat and has a futuristic feel in terms of weaponry and abilities. The gameplay can be compared to a mix of a MOBA and an FPS. 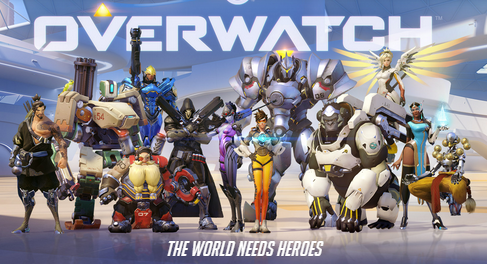 Overwatch features team exclusive characters in a Superhero vs. Supervillain type of battle, and each character will have their own set of weaponry and skills to use ranging from classes that focus on being a team's medic to a class capable of turning itself into a sentry gun and more. Characters have four skills and an ultimate ability which you can view along with their background stories and personal showcase videos at PlayOverwatch. Confirmed game modes so far consist of team-based objective modes like "Payload" where you'll be escorting an EMP from 1 point of the map to another whilst the other team tries to halt your progression. There is also another mode, "Point Capture", where you'll be trying to capture points on a map whilst the other team tries to fend off the offensive. As of right now a cinematic trailer and gameplay trailer have been released and uploaded to YouTube for the public who weren't able to witness the glorious reveal in person at BlizzCon. Shown in the gameplay trailer are what I assume to be all of the characters and some of their unique skills. Although a final release date has yet to be established, there's a beta planned for 2015 which is currently available for sign-ups at PlayOverwatch/beta.